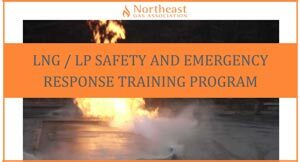 The Northeast Gas Association (NGA), in partnership with the Massachusetts Firefighting Academy, offers the most comprehensive LNG/LP safety and emergency response training program in the country, combining classroom instruction and hands-on training. The curriculum has been designed to address the requirements set for in the U.S. Department of Transportation regulations pertaining to LNG emergency training. The Program is recognized throughout the globe and has been attended by over 2,500 individuals from the United States and other countries, e.g., Chile, Trinidad and Tobago, Qatar, Singapore and Mexico. The relationship originated in the 1970's and was developed based on a common need to provide information and training involving natural gas, liquid natural gas (LNG) and propane. This unique public/private sector relationship has resulted in the development and operation of the LNG Safety and Emergency Response Training Program. Certificates are awarded to those successfully completing the full program. In-depth discussion of practical scenarios. Please have all employees signed up for any of the 2018 MFA classes, bring the waiver signed. Please know that the MFA will not allow anyone to participate without a signed waiver. Thank you. 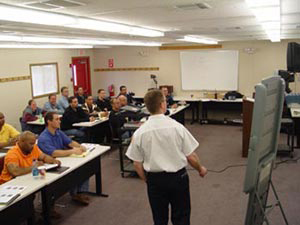 Norm Seymour is the Coordinator of the Flammable Gas Office at the Massachusetts Firefighting Academy. Norm has been with the MFA for 17+ years and an active fireman for 23 years. In addition to Norm, 8-12 (depending on class size) fire personnel with similar qualifications assist with the training. Discounted rooms are available at the Holiday Inn in Marlborough, MA. The hotel is 15 minutes from the Academy. Payment must accompany registration form in order for space to be held. Confirmed registrants who fail to attend and have not cancelled their registration 2 (two) weeks prior to the session are responsible for the entire fee. 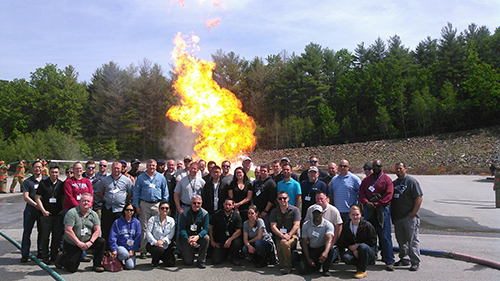 Granite State Gas Transmission, Inc.